We're studying Fra Angelico this week in Art. The kids drew something then cut out pieces of aluminum foil to glue onto their creations. Painting followed. Mary worked really hard on hers and then said it was just a doodle. Ha! Our rockin' tutor always has the best review games! See the balloon taped to the wall behind Mary? One at a time, each child ran to get a balloon off the wall (they were all over our room), then she ran back to the square and had to pop it. Mary couldn't pop it on her own; so with the tutor's help, I very stealthily hurried her along with some scissors. ;) Inside the balloon were two review questions. Awesome! The kids, of course, thought this was the bomb! So, I fell in love with these little fact cards, but I didn't know what in the world I was going to do with them. I printed them all out, laminated them, and then felt like a loser because I spent all this time and energy (and ink!) and had not a clue what to do next. Until . . . inspiration struck! I've always wanted to put together continent boxes, but I know I would never really use them. But, if I can put things in a binder, well, they'll get used a whole lot more! So, I now have a small binder from Staples that will serve as my stash of international fun ideas! 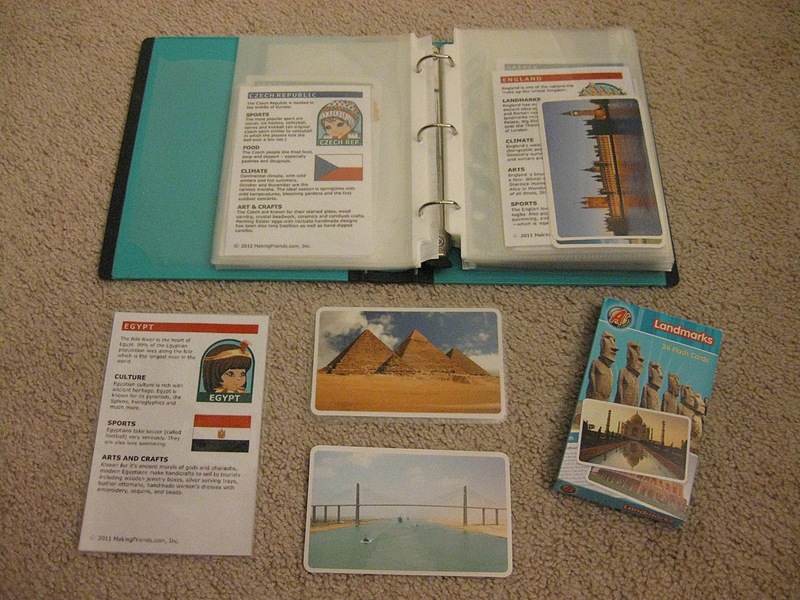 Inside the binder, each country has its own page protector sleeve. Right now, I have the passport cards and Landmarks of the World cards (Target $1 aisle around back-to-school time). And yes, that is the Suez Canal on the bottom! 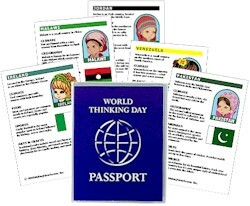 Last year I saw a Flags of the World flashcard set at Target, too, so I'll keep my eyes out for those in July and add them to the binder. And, I'll just keep on adding to it until it's full of neat information and pictures of the countries. How easy, right?! Do you have any ideas for keeping up with stuff like this? If so, I'd love to hear about it. Please leave a comment and fill us in! I always love, love, love reading comments, and I read every one. Do you ever read other blogs' comments? Sometimes, that's where you find the best stuff!